Xell offers targeted, rapid and efficient services for the development of custom cell culture media. As a leading company for custom cell culture media and feed development, Xell is your ideal partner to find solutions that meet your cell line‘s individual needs and empower them to deliver highest product yields. Depending on the application, and in close collaboration with you, we carefully choose individual target values for process performance. Following a streamlined workflow, we combine powerful spent media analysis with intelligent DoE and process simulations in order to reach your objectives in the most efficient way. We have previously developed custom cell culture media and feeds for cell lines like CHO, BHK, hybridoma, HEK and other human cell lines for customers throughout the biotech industry. Individual and highly efficient, these customized solutions represent the essence of Xell’s expertise. All of our media and feed products are chemically defined, animal component-free and available as liquid or powder formulations. Our collaborative team of experts leverages powerful tools, models and platforms to ensure that Xell effectively and efficiently meets the diverse needs of its customers. Fig. 1: Development of a platform medium for a protein-producing CHO cell line. Viable cell density (vcd) and viability of batch and fed-batch cultivations in shaking flask and in bioreactor scale are compared using a commercially available reference medium, a developed interstage medium and the developed platform medium. The latter provides an excellent basis for further fast and efficient development steps. Fig. 2: Maximum product titer for the cultures shown in figure 1. 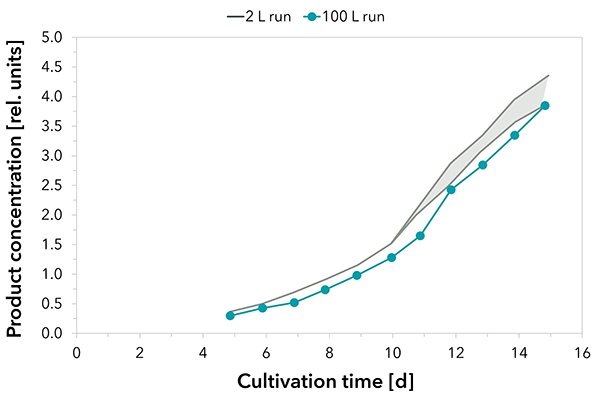 Titer in platform medium was 1.4–fold for batch cultivations and 2.6–fold for a bioreactor process with a simple feed, compared to reference cultivation. One of Xell’s partners, BIBITEC GmbH, is a successful GMP-certified CMO. The company is specialized in process development as well as flexible and rapid production of recombinant proteins and monoclonal antibodies from bench to 200 L scale with mammalian cells for clinical trials up to phase III. One well-known achievement of BIBITEC is the development of an EMA approved erythropoietin biosimilar (Silapo®). BIBITEC applied Xell’s customized medium and feed solutions in the GMP-production of material for pre-clinical and phase I clinical trials. The therapeutic recombinant fusion protein was produced in fed-batch processes with a CHO cell clone. Process development was performed in 2 L scale whereas the production process for clinical material was accomplished in a 100 L stainless steel stirred tank bioreactor. Cultivations were performed under standard conditions. A temperature shift was initialized when cells entered the stationary phase. 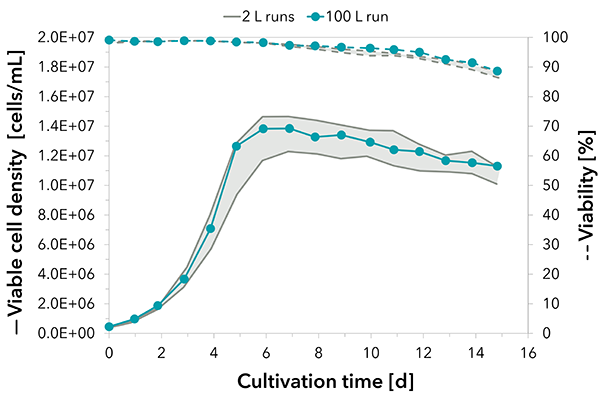 Upscaling was successful and reproducible growth performance could be demonstrated for a cultivation of 15 days (see FIG. 1). 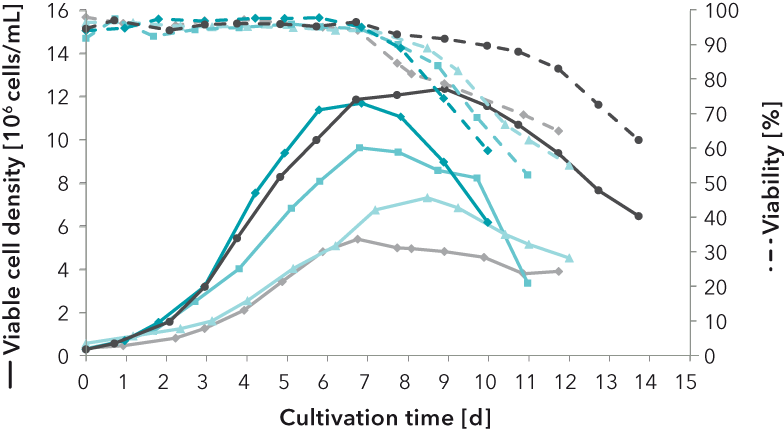 The peak viable cell density of significantly more than 1.3E+07 cells/mL at day 6 decreased slightly within the stationary phase due to volume increase by feeding. Consequently, very high viabilities were maintained throughout cultivation, dropping marginally below 90 % at day 15. Product formation of the fusion protein was monitored by RPHPLC. In both scales, comparable yields were detected (see FIG. 2). This case study is one example for the successful application of Xell’s customized medium and feed solutions in a GMP-production of therapeutic material. For further information, please contact us: info@xell.ag. Fig. 1: Viable cell density and cell viability in the 100 L production process run are comparable to runs from process development in 2 L scale, demonstrating the successful upscaling of the process. The shaded area illustrates the results of three independent 2 L runs. Fig. 2: Relative product concentration for the 100 L scale production process run and runs from process development in 2 L scale (shaded area, n=3).